Glasgow FrontRunners into fifth year! | LEAP Sports Scotland LGBT running club – Glasgow FrontRunners – is going from strength to strength as it prepares to celebrate its fifth birthday in August. "> LGBT running club – Glasgow FrontRunners – is going from strength to strength as it prepares to celebrate its fifth birthday in August. LEAP Sports > News > Glasgow FrontRunners into fifth year! The group has attracted considerable attention since its inception and was recently featured as part of the BBC’s ‘Get Inspired’ series. The group is part of a network of FrontRunners groups that started in San Francisco in 1974. 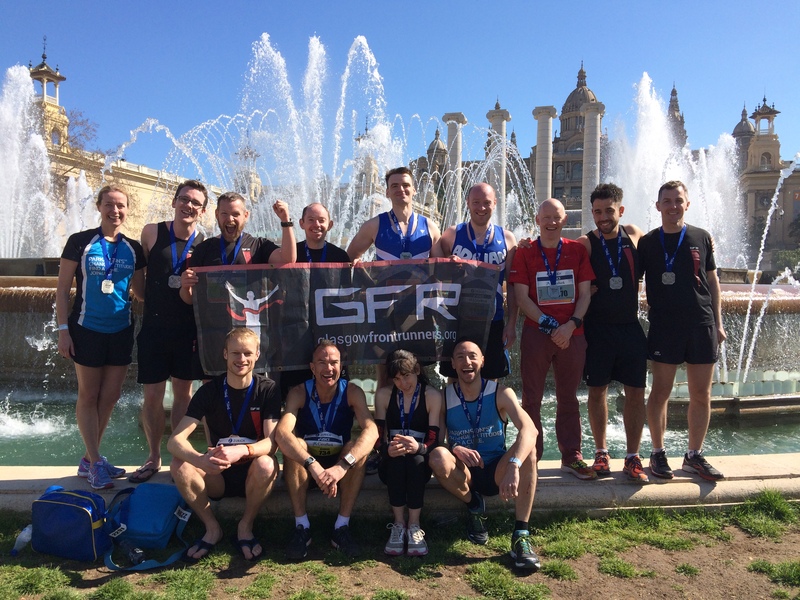 This international presence was reflected in the bumper turnout at Barcelona Marathon in May, which was the largest representation of FrontRunners at a European race! The Glasgow group returned from the Catalan city with some impressive times and achievements, which have inspired other members to take part in several upcoming events. In addition to this, the group saw the largest ever number complete its annual Couch to 5K programme, culminating at Glasgow’s Victoria Park run. Despite the heavy rain, the runners were determined to achieve their goal of running 5k! Since their graduation there has been no stopping the new recruits as many of them are participating in the 10k weekly run and several have signed up to take part in the Men and Women’s 10k races in Glasgow. Glasgow FrontRunners are now looking forward to participating in Edinburgh Marathon in May and the Great Scottish Run in October. The group meets twice a week at The Arc at Glasgow Caledonian University – every Thursday evening at 6:15pm and Sunday morning at 10:30am. It offers a wide range of runs suitable for absolute beginners to long distance runners. For more information, visit the Glasgow FrontRunners website (http://glasgowfrontrunners.org). Written on 22nd May 2015.